This post from June 2011 was updated in November 2011, January 2012, April 2014 and February 2017. This recipe makes wonderful bread: crusty, open-textured, moist, and beautiful. It needs no kneading, but this doesn’t imply a trade-off. It’s a recipe for a perfect loaf which happens to be almost effortless, and also an effortless recipe which happens to make a near-perfect loaf. It’s based on Jim Lahey’s recipe from the New York Times in 2006 (also the subject of an article and accompanying video, and now a full-length book). But it’s even easier, as there’s no awkward middle stage with linen cloths. In the eight months since I started using it, I’ve made virtually all the family’s bread. A lidded cast-iron casserole pot, around 21cm diameter (I’ve been told that a ceramic pot also works, but I haven’t tried this). The bread-making usual: scales (preferably electronic, for accuracy), mixing bowl, measuring jug, wooden spoon, wire rack, timer, oven. If you need any of this equipment, the above pictures link to Amazon (who give me a referral fee if you buy something). There are three short steps, separated by two risings. Measure 450g of flour into the bowl. Add the salt and yeast, and stir briefly to mix in. Pour in the water, all at once. Stir until fully mixed. The result will be somewhat stickier and wetter than a standard dough. Attempting to knead it would be messy and probably unsuccessful. To speed things up, especially in cold weather, use warm water (one part boiling to three or four parts cold). The yeast quantity is a lot less than a standard bread recipe (and probably the back of your yeast packet) calls for: it’s not a mistake. There’s also no need to reactivate it in the water first. But make sure it’s not too old, or its oomph may be gone. Don’t skimp on the salt. Under-salted bread is really disappointing. Cover the bowl with a large plate and leave for 12 – 24 hours at room temperature (or somewhere a bit warmer, like an airing cupboard). The dough will have substantially increased in size, and spread out across the bowl. Its level top will dotted with bubbles, and it will be even more wet and gooey than before. Stir in another handful or two of flour. The mixture should still be stretchy, and still stick to the bowl a little, but now also be half-capable of holding its shape. Cover the bowl again and leave for another 4 – 12 hours. Then put the lidded casserole pot in the oven and start pre-heating to around 220 degrees C. Depending on your oven this might take 15 – 30 minutes. Take the now-super-hot pot from the oven and remove the lid. Throw a bit of flour in the bottom to help stop the loaf sticking. Tip and scrape the re-risen dough into the pot, doing your best not to knock out all the air. It should look rough, ugly, and unpromising! Throw a bit more flour over the top for effect. Replace the lid and return the pot to the oven. After half an hour, remove the lid and (maybe: it depends how hot your oven is and how dark you like the crust) reduce the heat by 20 – 30 degrees. After a further 15 minutes, take the pot from the oven. Tip the loaf out and leave it to cool on a wire rack. Admire! In summary, it’s: 15 – 30 minutes pre-heating the pot, 30 minutes baking with the lid on, and 15 minutes baking at a slightly reduced temperature with the lid off. A timer/alarm is handy. A rounded flexible scraper (mine is cut out of the bottom of a plastic take-away carton) is good for smoothly transferring the dough from bowl to pot. Some ovens are hotter than others. Experiment. If the loaf sticks to the pot, try turning up the oven a bit, and be sure to use plenty of flour or seeds on the bottom. It also helps if the pot is seasoned, so don’t wash it between loaves. You can scrape off any stuck bits with a wooden spoon. I rarely keep it this simple: various combinations of flours and seeds make a more interesting loaf. Carpet the bottom of the casserole pot with poppy seeds just before you tip the dough in, and carpet the top of the dough with more seeds straight after (mere sprinklings will disappoint). The seeds stick pretty tight and toast just the right amount during baking. Carpet the pot-bottom and loaf-top as above, but this time with plenty of sesame seeds. Also replace 75g of the white flour with wholemeal bread flour. More options: add a teaspoon of toasted sesame oil, or use barley flour instead of wholemeal, for an even nuttier flavour. Replace 150g of the wheat flour with rye — which makes a tastier but heavier bread — and add a good teaspoon of caraway seeds to the dry ingredients at step 1. This loaf comes out looking gorgeous and artisanal if dusted with semolina flour just before baking. In this and other loaves that include a wholegrain flour you might need to up the water quantity by 10g or so. Replace 180g of the plain bread flour with a malted bread flour. Possibly throw in some seeds (e.g. linseeds, sesame seeds, poppy seeds). Crunchy and delicious, and it smells amazing (this is the one to bake if you’re selling your house). Err on the generous side with these spice quantities. Excellent fresh or toasted. 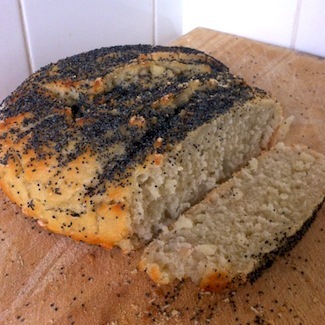 For some coeliac friends we’ve made the poppy seed recipe, but replacing all the flour with the Doves Farm gluten-free variety, with surprisingly acceptable results (pictured right). It’s a little bit chewy, but if eaten the same day it’s still tasty, crusty and moist. Experiments with adding xanthan gum — which is sometimes used to give gluten-free doughs a bit of bounce — have had disastrously sticky and dense results, though. The recipe might sound demanding, but the steps are quick and the pauses flexible enough that they can probably be fitted around your schedule. In the week, I typically do step 1 in the evening after work, step 2 the next morning before work, and step 3 (baking) that evening. One loaf lasts us one to two days. The second rising can be done in two hours or so at a push, so you can also do the whole thing in one day if you do step 1 first thing and steps 2 and 3 the same evening. Organic flour costs about 60p per loaf, ordinary flour around 30p. The electricity or gas should come in under 20p, so you’re looking at well under a pound a loaf either way. A domestic oven baking one loaf is almost certainly less energy-efficient than a commercial oven baking many, so making your own bread is probably not entirely green. Then again, if your oven is electric you could switch to renewable electricity. Never made bread before but this looked straightforward so had a go. Really good result and between Michele Joe Aaron and I the loaf disappeared in less than 20 mins! I am thinking of using this to try rye bread with caraway seeds. Any additional tips you can offer?